This Sunday’s first reading comes from the Prophet Isaiah. In it we hear the words of the Sanctus. In a vision Isaiah hears the angels sing Holy, Holy, Holy is the Lord of hosts. He then hears the voice of the Lord say, “Whom shall I send? 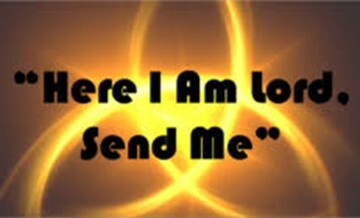 Who will be our messenger?” Isaiah replies,” Here I am, send me.” This response is wonderful because it is immediate; it is as if he doesn’t think about the implications but embraces what God asks of him. God calls each of us every day in a very similar way. He calls us to love, to love our neighbour and to love ourselves. The question is, are we willing to answer that call in the way Isaiah did or Bishop Byrne? In Luke’s Gospel this week, Jesus is busy with his public ministry. After a night of teaching Jesus asks Peter to put out the nets again. Without question Peter obliges. A massive haul of fish is caught to the amazement of all. As a result of this Peter falls to his knees, “Leave me Lord, I am a sinful man.” Instead Jesus says, “Do not be afraid; from now on it is men you will catch.” That belief Jesus had in Peter he has in YOU today. Do not be afraid.